I swear it is like I blink and I'm writing another monthly update! I know I have said this on every one of these posts, but time is FLLYYYYINNNGG by so fast, and it really is so bittersweet to think of how quickly every moment and milestone passes by. Speaking of milestones, Georgia has been hitting them fast lately. She went from crab walking to crawling in just a few days and now she is using her walker like an absolute champ. She wishes she were running already but we aren't quite there yet. She hasn't stood unassisted but she will be soon I can tell. She went from the lazy wrist wave to the perfected little hand wave which is absolutely adorable. She is also pointing at everything and everyone. She loves to say mama, and dada, and yaya amongst other random noises, raspberry blowing, and babbling. She's a real charmer and smiles at everyone. She acts like she is shy when she meets a stranger and leans in to whoever is holding her but we all know she is a little social butterfly. Georgia still has ZERO teeth, she is in size 12 clothes mostly, some 9 month stuff still fits her. I am guessing she's a little over 18 pounds. She's tiny but she loves to eat. She eats everything we do and has serious food envy if we are eating and she isn't. We still do some purees but I make them a lot chunkier now so she has some texture. Girl has not met a food she doesn't like including sea food (which mama despises but daddy loves). Poor girl has been sick often this season. We spent last Wednesday night in the ER with her and she was diagnosed with an upper respiratory infection. Luckily she tested negative for RSV (which is what I thought it might be) and influenza which is going around like crazy right now. Georgia got her flu shot and so did mama and it seems to have worked for us. Last Sunday she started this awful cough and then by Wednesday her fever had spiked to 103 so we took her to the ER. She was given amoxicillin and told to continue motrin and Tylenol until the fever broke which it finally did on Christmas Eve. As of today she is back to herself about 90%. 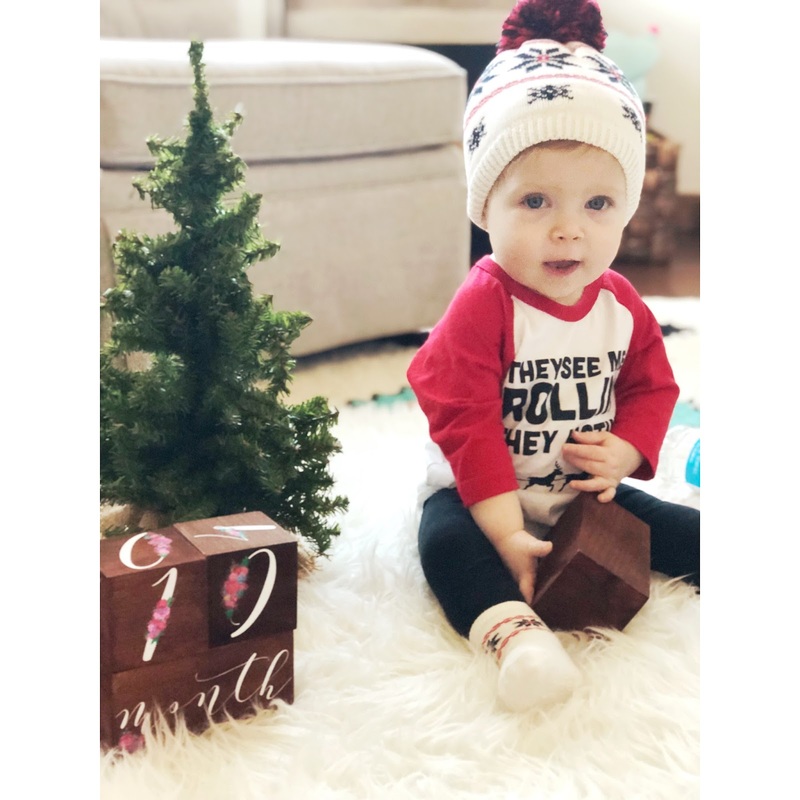 Experiencing her first Christmas was absolutely wonderful and I hope to get the time to do a separate post about it, but because of how busy our lives are over the next couple weeks I'm not sure I will get to it. Although she was sick, she was an absolute trooper. She was very clingy to mama, but she tolerated being passed around to all her family members so that they could get their cuddles in and mama could get a break! She loved the pool at Starved Rock and our stay over went really well and was so fun. Saturday was family Christmas on my MIL's side and wow was it a whirlwind! LOTS of kids and lots of fun! Christmas Eve we got to relax most of the morning before we headed out for a late lunch, a visit with Joe's grandma, and then to my uncles, and finished the night off at Joe's moms for our annual PJ's which were extra special this year. Christmas Day we spent the entire day at our house opening gifts with family members, eating, and watching Christmas movies all day! Having a child at Christmas is so fun and so wonderful and I'm sure only gets better as they get older. We are also looking forward to our trip to Punta Cana on January 6th! Any tips for flying 5 hours with a 10 month old are greatly appreciated! I cannot wait to see her on the beach. 10 months have gone by in the blink of an eye and when we get back from vacation the planning for her first birthday will commence. We love you so much Georgia June! So glad to hear Georgia is doing better! It really does go by way too quickly. I have been looking back at a lot of Rory's pictures from this time last year when she was less than a week old.